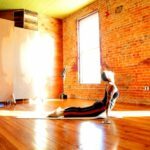 Located in the heart of Durham, Global Breath Studio is the Home of MindBody Centering Yoga & LiveGlobally. Pioneering Yoga Classes, Teacher Trainings, Yoga Therapy, Workshops, Retreats, and World Changing Initiatives. Come practice in community! Everything we do at Global Breath supports the building of the Ingrid School in Kenya.